Craniofacial defect repair is often limited by a finite supply of available autologous tissue (ie, bone) and less than ideal alternatives. Therefore, other methods to produce bony healing must be explored. Several studies have demonstrated that low-frequency pulsed electromagnetic field (PEMF) stimulation (ie, 5–30 Hz) of osteoblasts enhances bone formation. The current study was designed to investigate whether a Food and Drug Administration–approved pulsed radiofrequency electromagnetic field device (ActiPatch) is capable of inducing osteogenic differentiation of osteoprogenitor cells. Osteoprogenitor cells (commercially available C3H10T1/2 and mouse calvarial) in complete Dulbecco modified Eagle medium were continuously exposed to PEMF stimulation delivered by the ActiPatch at a frequency of 27.1 MHz. Markers of cellular proliferation and early, intermediate, and terminal osteogenic differentiation were measured and compared with un-stimulated controls. PEMF stimulation increases alkaline phosphatase activity in both cell lines. 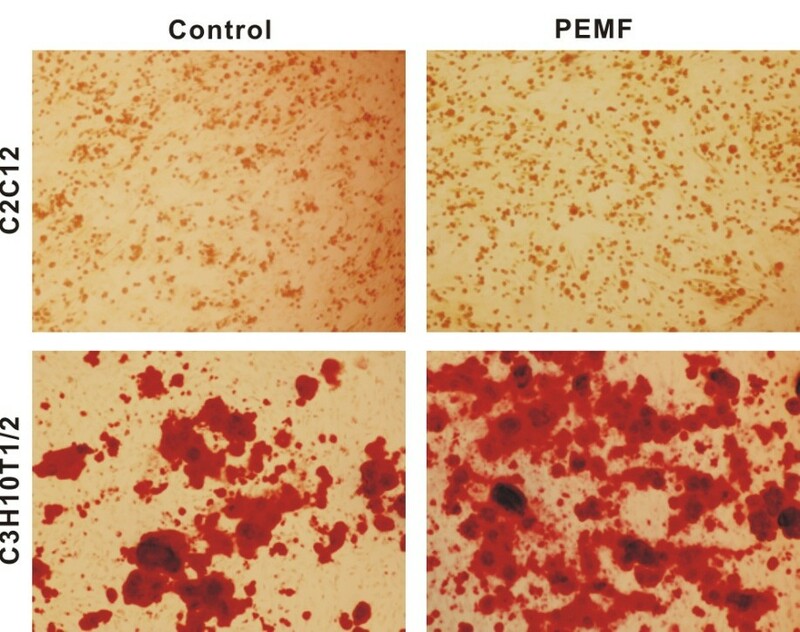 In addition, PEMF stimulation augments osteopontin and osteocalcin expression as well as mineral nodule formation in C3H10T1/2 cells, indicating late and terminal osteogenic differentiation, respectively. Cellular proliferation, however, was unaffected by PEMF stimulation. Mechanistically, high-frequency PEMF-stimulated osteogenic differentiation is associated with elevated mRNA expression levels of osteogenic bone morphogenetic proteins in C3H10T1/2 cells. Our findings suggest that high-frequency PEMF stimulation of osteoprogenitor cells may be explored as an effective tissue engineering strategy to treat critical-size osseous defects of the craniofacial and axial skeleton.